In my book A Chic and Simple Christmas, there is a chapter about looking forward to the new year. I was thinking about one section of this chapter today, and it is about continuing on the good feeling of Christmas (perhaps the lead-up, not the aftermath when you are totally over everything) throughout the year. My specific thoughts were on how I could make it feel like it was Christmas every day. I’m not planning on leaving my tree up or playing carols or anything like that, but just how could the magical feeling of Christmas be recreated every day of the year? There must be similar things that we do at Christmas that can give us a glittery, happy feeling inside on a daily basis. Here are my five top tips to create a festive feeling no matter the time of year. Feel kind towards others. This Christmas I kept away from the shops as much as possible, but when I did go, people were in a good mood. Even those who were working looked quite happy and were cheery, even if they were tired and looking forward to the end-of-year break. I was also in a good mood most of the time, and it seems nutty that just because the festive season is here we can feel so much happier than at other times of the year. Why not make your whole year feel festive? Play feel-good music. I played more music in December than in other months. I switched on my favourite Christmas tunes as a matter of course each day. To continue this on I am going to click my iPod into action every day, and have fun creating new playlists to enjoy. I have quite a few playlists already, but I think it’s about time for some new ones to join ‘Billy Joel’, ‘Hotel Lobby Piano’, ‘Motown’, ‘Buddha-Bar’ and ‘Fiona’s Favourites’. I will create day-long playlists so I can have lots of new ones to look forward to. Add décor touches to your home that make you feel happy. My beautiful new-this-year 7ft tree in red, gold and small touches of silver with tartan ribbon furled around makes me happy every time I see it. I even have the white lights switched on during the day (don’t worry, I switch them off when I go out). What décor touches can I make sure to keep up in my home that bring about that lovely feeling? Rotate my pretty candle holders on the coffee table, and research stylish table-scapes that I can make with books and items I already own on Pinterest. I adore beautiful fragrances, as you can see from the image, and these always help me feel happier. An Ecoya candle in Coral & Narcissus (which smells a lot like Issey Miyake’s perfume), and Surmanti’s Christmas Lily candle and Peonies Peppers & Tuberose reeds. I got very lucky in the Christmas gift department this year. Entertain – invite people around. We entertained more in December than at other times, and it was nice. We had dinners, plus I entertained family and lady-friends in the afternoon, for tea. I will be more intentional about keeping this up, because it’s something lovely, and it doesn’t have to cost a lot or take a lot of effort. It feels festive and welcoming to have someone around to your home. Have good things to look forward to. We look forward to Christmas day. We look forward to visitors, outings, gifts, meals and drinks. Why not create things to look forward to every week? Coffee out, reading a new book (‘new’ new or from the library or op shop), having someone over, planning a holiday, starting a craft project, a browsing shopping trip to plan your new season wardrobe, upgrading something in your home and researching that; these are some of my thoughts and I’m sure you will have plenty of your own that may be more suited to your taste. What it comes down to is appreciating your everyday luxuries, creating more reasons for yourself to feel good, and taking your fun where you can get it. Some months can feel drab, so why not say to yourself ‘How can I make March feel as magical as Christmas?’ for example, and brainstorm all the kinds of things you’d love to experience. What comes to mind when you think of creating an everyday festive feeling? I’d love you to share your favourite tip. My first (and still most popular) book 'Thirty Chic Days: Practical' inspiration for a beautiful life' is available as an audiobook. 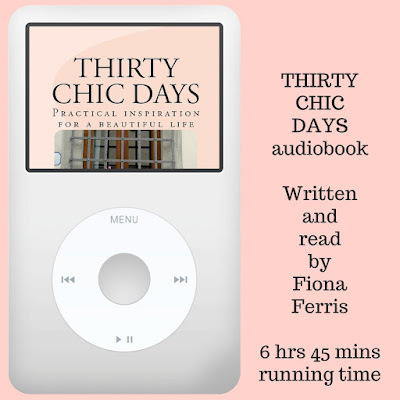 I narrate the audio version of Thirty Chic Days myself, and each of the days/chapters are a separate MP3 track for easy bookmarking and so you can play them on random/shuffle too. I love doing this when I am listening to an audiobook that doesn't require you to go through the chapters in a linear fashion. It feels like whatever chapter comes next is the one I need to hear right now. The audiobook is 6 hours and 45 minutes long in total, and comes wrapped in a zip file for easy downloading (it could still take a little bit to download though because it's a large file, so please be patient). Download the 'Thirty Chic Days' audiobook here.